The Women In Trucking Association’s mission is simply to increase the percentage of women employed in transportation careers. Whether the role is driver, technician, safety professional, engineer, manager or one of the many other positions in supply chain, our focus is to attract and retain more women at all levels. The Accelerate! Conference and Expo brings this goal into one very educational, but motivational and fun-filled event and this year was no exception. Although this was only our third annual conference, over 500 women and men were there to learn, network and relax. If you missed it, here are some of the things we learned. Our keynote speaker, Valerie Alexander, charmed and challenged the audience her insight in “How to succeed in trucking despite having female brains.” Valerie also ended the conference with how to create happiness and engagement in the workplace. She asked the audience to list ten positive things that might result from a negative experience, using industry examples to illustrate the case. Admiral Robert Wray, CEO of Citadel Fleet Safety, talked about leadership and provided lessons he learned in his four decades of experience in both wartime and peace. He challenged the audience to become more confident, but humble leaders in their organizations and provided numerous stories of action-oriented guidance from his years as a nuclear engineer in the Navy. Former Federal Motor Carrier Safety Administrator (FMCSA), Annette Sandberg, shared stories from her experiences as the youngest, and first female, State Patrol Chief in the US. She encouraged the audience to maintain their sense of humor, but to establish boundaries and keep them intact without alienating others. Ms. Sandberg currently is the Principal of TranSafe Consulting, LLC, which provides transportation, safety and security consulting services. David Coleman, known as “The Dating Doctor TM” spoke about relationship issues at work and in social settings in his talk, “Positive People Produce.” Coleman’s interactive presentation included a session with attendees talking about their strengths and weaknesses and using the conversation to build confidence in others and themselves. The audience learned how their words and actions can turn relationships into a positive direction that is safe, empowering and affirming. Returning speaker, Joel McGinley, of TranStrategy Partners spoke about how to “Elevate your Game: A message of Personal Transformation.” McGinley gave the attendees an understanding of what holds them back from transformational growth and how to overcome these challenges. He provided tools to empower and encourage each person to create the career they want. Sirius/XM’s Road Dog Channel’s Freewheelin’ host, Meredith Ochs, moderated a panel of women who offered their insight into becoming successful leaders. The three finalists for the Influential Women in Trucking Award sponsored by Freightliner participated. Traci Crane, Senior Manager of Fleet Services at CFI, Inc., Tana Greene, CEO and Founder of Blue Bloodhound and Daphne Jefferson, former Deputy Administrator of the FMCSA were the three finalists. They were joined by last year’s Influential Woman in Trucking, Ramona Hood, of Genco. These four women shared their insight into how they succeeded in transportation careers and offered advice to not only believe in yourself and your professional goals, but to move beyond your comfort zone and achieve great things. Daphne Jefferson was named this year’s Influential Woman in Trucking. In addition to presentations that challenged and empowered the attendees, there were many panel discussions, lunchtime table topic conversations and plenty of industry-related talks ranging from driver health and wellness to ELD mandates. The FMCSA held a Q & A session to offer the latest rulings affecting drivers. We also announced an initiative with Expediter Services to provide funding to 150 women starting businesses in trucking. The Women In Trucking Association initiated a Best Practices Survey to better understand how carriers that employ a high percentage of female drivers attract and retain these women. Keera Brooks of Sawgrass Logistics conducted the survey and presented the findings along with a panel of carrier executives who shared their strategies. The attendees learned that women leave companies for different reasons than men and look for different things when choosing a carrier. This research will be available to all corporate members of the association shortly and will be game-changing for carriers looking to hire more female drivers. The entire conference was fast-paced, and jam-packed, but many attendees took the time to take a tour of the trucks feature new technologies from companies such as Autobon, Freightliner, Peterbilt, Volvo, and ZF. The Women In Trucking 2014 Volvo VNL donated by Arrow Truck Sales was also on display. This vehicle will be given away at the Salute to Women Behind the Wheel in March at the Mid-America Trucking Show. If you missed this year’s Accelerate! Conference and Expo, be sure to mark your calendar for next year’s event to be held in Frisco (Dallas) Texas November 12-14. For more information, visit the Women In Trucking Association website at www.womenintrucking.org. We look forward to seeing you there! 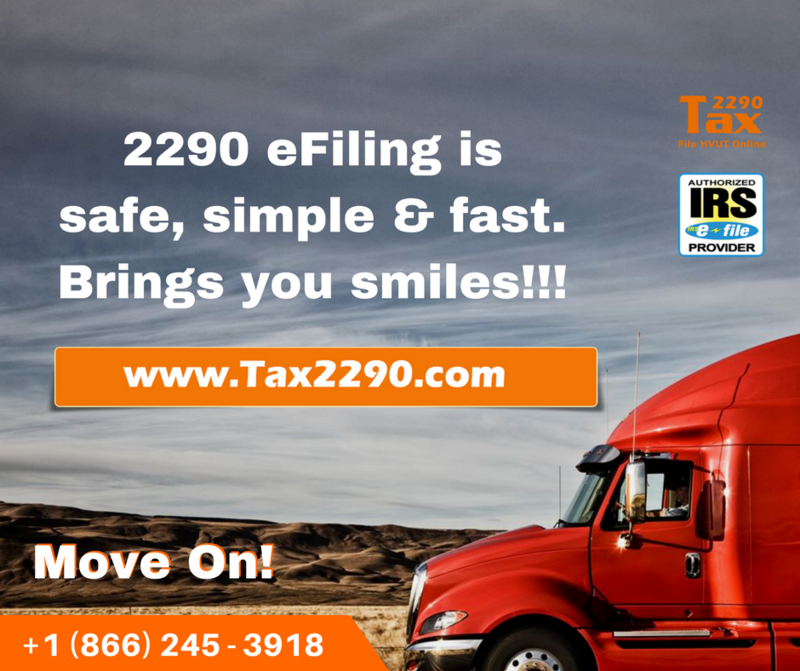 IRS Tax Form 2290 electronic filing is Simple, Easy & Fast with Tax2290.com. The federal vehicle use tax on highway heavy motor vehicle can be prepared and reported online, electronically at http://Tax2290.com, an IRS authorized e-File service provider since 2007. Tax2290.com is the 1st ever IRS certified website for all 2290 and excise tax needs, powered by TaxExcise.com and ThinkTrade, Inc. an Tennessee based online tax preparation company. e-File saves you time and brings you smiles… “Do it Yourself” website will enable you to prepare and report your 2290s in just minutes. Convenient and comfortable eFiling experience, users rate it as No.1 website for all 2290 needs since 2007.
e-File is the fastest way of getting your 2290s proceeded by IRS and receive IRS stamped Schedule-1 proof in just minutes. No more hazel, move ahead to all new digital experience of preparing and reporting your 2290s, from anywhere anytime! This entry was posted in Guest Blogs and tagged 2290 tax, 2290 tax due date, 2290 tax online, Ellen Voie, Ellen Voie Article, Ellen Voie Blog, form 2290 due date, Tax 2290, tax 2290 efile, tax 2290 online, WIT, Women In Trucking, Women in Trucking Association, women truck drivers, women truckers on December 1, 2017 by Ellen Voie.